Les Bon Temps Roux! Let the Good Times Roll! 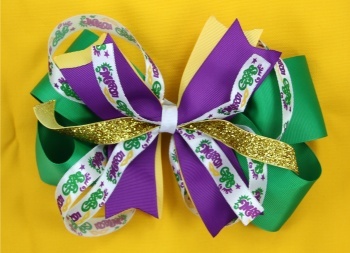 Put on this Mardi Gras Bow and head out to the parades. Dress your little ones up in their favorite costume or tee shirt and this bow will look fabulous. This bow has a 2.25" green grosgrain ribbon on the bottom and is covered with a pinwheel spike of purple, yellow and gold ribbons. There is a white satin ribbon that says Mardi Gras and has Mardi Gras masks running through it. The center has a white grosgrain ribbon and it is attached to a French clip.